All the hard luck and heartache in the first half of 2008 has been washed away. No matter what happens the rest of the season, Risi Competizione can claim the GT2 championship at the 24 Hours of Le Mans. The Houston-based team and drivers Mika Salo, Jaime Melo and Gianmaria Bruni scored an eight-lap victory for Risi's first win since closing 2007 with a triumph at Mazda Raceway Laguna Seca to clinch the American Le Mans Series GT2 title. "It's a lifetime achievement, especially to do it with Ferrari, and if you are a professional in the automotive world, there is no greater achievement. I can't say enough about it," said team owner Giuseppe Risi, who was a partner with the class-winning Doyle-Risi Racing Ferrari 333SP in 1998. "To me, winning Le Mans is worth winning a whole championship. One talks about Le Mans in very light terms but until you come here and have to grind through the night, hoping that the car holds together, racing against other people you respect and who are highly qualified to come here...and you see drivers who are top level but who have accidents and fall by the wayside." 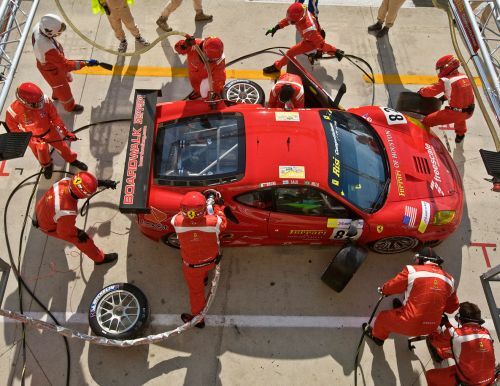 The manner in which the Risi Ferrari won Sunday was methodical and in a way surprising. Having two of the leading Porsches - Flying Lizard Motorsports and IMSA Performance - crash into each other certainly didn't hurt. 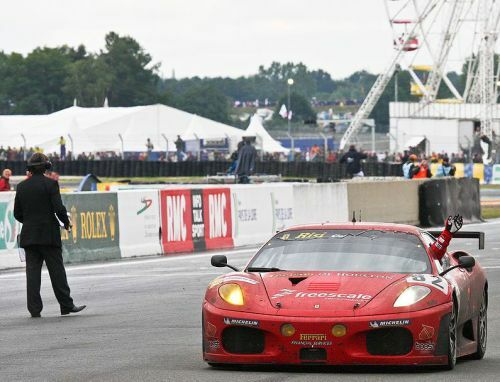 Melo drove the opening two stints into the second hour as the Ferrari took a firm hold on the class lead. The trio didn't relinquish the lead except on pit stops and seized control when the second-place Virgo Motorsport Ferrari retired with less than three hours left. There still was the race itself to battle. The final 12 hours were a mix of driving in the dry and wet, and there was the endurance factor to consider as well that brought both physical and mental fatigue. "This means a lot to me. The team did a very good job and fortunately we didn't have any problems during the race," said Melo. "We just kept safe and consistent and made no mistakes, and this was one of the most important points to winning the race. "The most difficult part for me was about 4:30 a.m., when it was raining and I had just started running," he added. "In the night you can't really see how much water there is on the track and it was difficult to make decisions about the line and the tires but we kept it on the track. Michelin did a very good job for us - we could double or even triple stint the tires during the night - and that helped us a lot." Risi's early-season woes have been well-documented. After winning nine times in 2007, the Ferrari crashed out just prior to the halfway point at Sebring while ahead by a lap. Salo and Melo finished 10th at St. Petersburg and ninth at Long Beach before another non-points finish at Salt Lake City after Melo ran into the LG Motorsports Corvette C6. As a result, Salo and Melo trail championship leaders Jörg Bergmeister and Wolf Henzler of Flying Lizard by 65 points, a nearly impossible margin to make up in seven races. 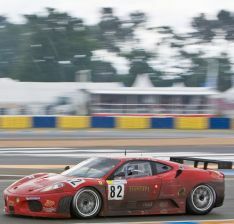 But at least until the next American Le Mans Series race on July 12 at Lime Rock Park, Risi has the bragging rights. "GT2 is fun - especially when you win," Salo said. "It was a very good day for Jaime, me and Gimmi, for Risi and also for Ferrari. To have four Ferraris in the top six cars is impressive. They were all on different tires, but we proved which are the best. Luckily we could double or triple stint our Michelins which gave us a good advantage." The next round of the American Le Mans Series is the American Le Mans Northeast Grand Prix. The race is scheduled for 2 p.m. ET on Saturday, July 12 at Lime Rock Park. SPEED will televise the race from noon to 3 p.m. ET on Sunday, July 13. XM Satellite Radio will air the event live on XM Sports Nation Channel 144. Additional live coverage from American Le Mans Radio and IMSA's Live Timing & Scoring also will be available at www.americanlemans.com.